[Jesus said,] "The Father loves me because I sacrifice my life so I may take it back again. No one can take my life from me. I sacrifice it voluntarily. For I have the authority to lay it down when I want to and also to take it up again. For this is what my Father has commanded." 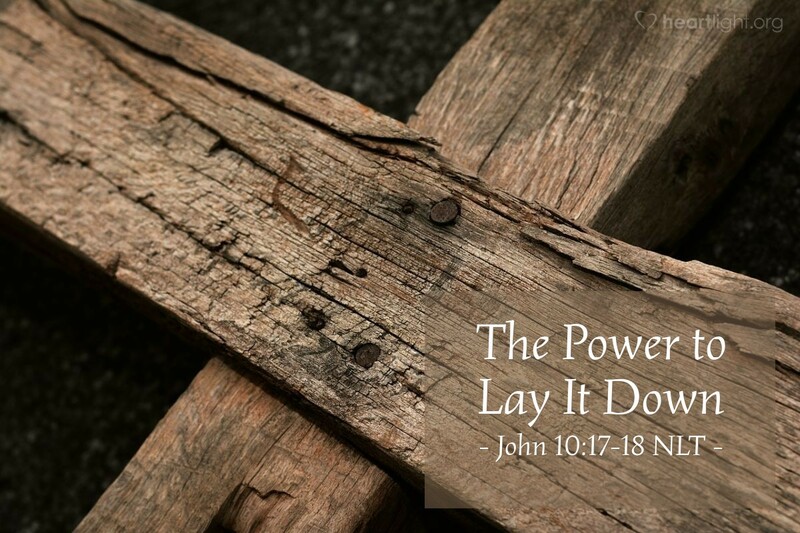 Jesus didn't just die; he died with power and authority. His life wasn't taken from him; he laid it down willingly to die for our sins. His crucifixion was an apparent defeat for him, but it was turned into a lasting defeat for the evil one who sought to use Jesus' death to win a victory over God. No one could take Jesus' life. He gave it willingly to save us and purchase us from death. The cross is God's power demonstrated in humanity's worst forum. The cross is our glory! Father, as the old hymn says, "My glory all the cross." I thank you for purchasing me from sin and death through the gift of Jesus. I trust in your sacrifice to atone for my sins. I entrust my life to Jesus, who had the power both to lay down his life for me and to take that life back up again for my eternal salvation. Praise and glory be to you, dear Father, and to the Son who is to be forever praised. Amen.